The ancient city of Lincoln is well-known as a Roman city, Lindum. 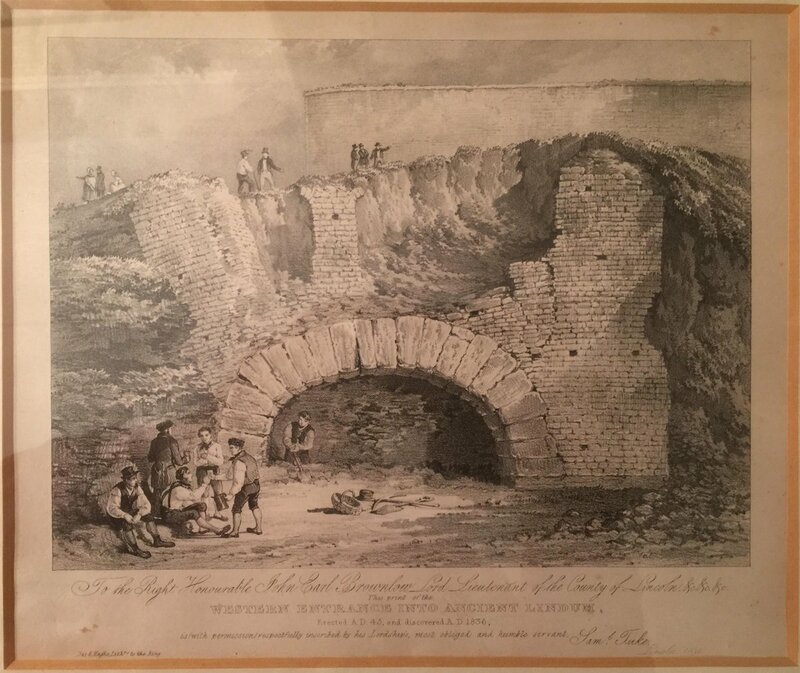 But an interesting discovery was made in 1836 by a rascally inn-keeper, who was burrowing away at the castle mound, trying to expand his premises. He came across the Roman west gate. Not the foundations. The whole gatehouse had been buried when the Norman mound was built, and it was intact, certainly to the extent of the first floor chamber. Unfortunately the pressure of earth caused a partial collapse within a few days; and then the authorities stepped in and ordered its reburial where, to my knowledge, it still is. I owe my knowledge of all this to Dr Caitlin Green on Twitter here. But I feel that it is worth exploring the sources a bit. MR. URBAN, Lincoln, May 17. The ditch around the walls of the castle having been suffered to get into private hands, the greater part of it has been filled up for the purpose of being formed into building ground, and the picturesque appearance of the old castle has been nearly destroyed by the erection of a large number of small tenements and other buildings near to its walls. With a view of pursuing this barbarous practice, an individual of the name of Ball has been recently engaged in filling up the ditch at the north-west corner, near to the Sally Port, and has thrown down, to the great danger it is to be feared of the castle walls, a large portion of the earthen bulwark. This, however, has led to a most unexpected result, the discovery of the western gate of the old Roman city, which was found in the bank on Monday the eleventh of April last, where it has no doubt been hid for more than seven hundred years. It will be seen from the Plate, that the long-lost Western gate was near to, and a little north of the Sally Port, and that it was buried in the earth when the fortifications were constructed by our Norman conquerors. This very interesting relic of the great Roman people was, however, no sooner found, than it was again lost for ever, as the square mass of masonry nearest the Sally Port gave way on the Friday after it was first discovered, and the fine old arch, constructed in all probability more than fifteen hundred years ago, fell to the ground. As the workmen had only partly excavated the arch at the time it fell, any account of its dimensions must necessarily be in some respects a matter of conjecture; it appeared how ever to have been very similar to the North gate, measuring about fifteen feet in the clear, and being composed of about the same number of large ponderous stones four feet deep from front to back, two feet high, and from twelve to eighteen inches broad. On each side, the masonry was carried up above the crown of the arch for about twelve feet, and went, no doubt, originally much higher, forming two pillars or wings measuring seven feet by four; and between these the work men represent there were the remains of three smaller arches forming as many openings four feet wide over the centre of the great gate. The arch had in some degree lost its proper semicircular form, and had become a little flattened towards the north abutment, which had been thrown considerably out of the perpendicular, causing two of the large stones to separate more than four inches at the bottom. 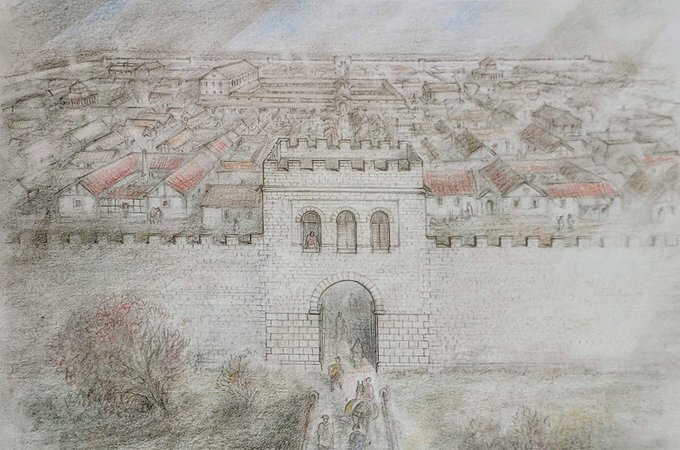 The traces of the Roman wall are very apparent in various parts around Lincoln, and as this great gate must have been double, the inner arch may be buried in the earth a little way within the area of the castle, as will appear probable on inspecting the Plan in Camden’s Britannia, by Gough, Vol. II. Pl. v1.11. and drawing a straight line from the marks indicating the remains of the Roman wall on each side of the castle. 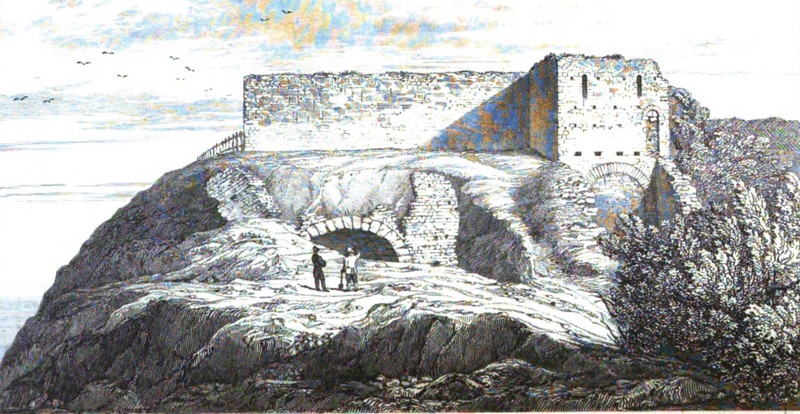 The crown of the recently discovered arch was about nineteen feet below the castle walls, about thirty-five feet in advance of them, and the entire front occupied a space of thirty-three feet. The posterns, if there were any, have not yet been exposed to view; and it is not now probable any further excavations will be permitted, as the Vice-Chancellor has recently granted an in junction against Ball, restraining him from doing further damage to the castle walls by removing more earth from the western mound. In making the excavations, three Roman coins, and the iron head of an arrow, bent and blunted at the point, were found. Two of the coins are so much cankered and defaced, that it is impossible to decypher them; but the other is a Galba in good preservation. On the obverse around the head of the Emperor is the inscription IMP. SER . GALBA CAESAR AVG . P: M. and on the reverse is the legend DIVA AVGVSTA, with the figure of Concord holding a chaplet in her right hand, and a hasta pura in the left. This may be considered rather a scarce coin, as the emperor Galba reigned less than seven months, having succeeded Nero in the middle of the year of our Lord 63, and fallen a sacrifice to his avarice and severity at the very commencement of the year following, in which short period no very great number of medals could be coined. FREDERICK BURTON. The wretched “Ball” is apparently a certain Philip Ball, as an 1854 guidebook to Lincoln, The Strangers’ illustrated guide through Lincoln, by George Lockyer, p.6 makes plain. 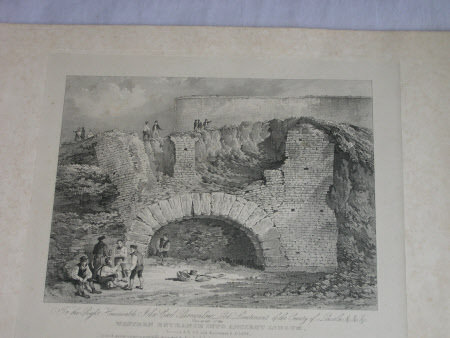 It also documents the process of widespread destruction of the Roman walls then in progress. the arch was completely bared, and exhibited a counterpart of the north gate, with this difference, that no posterns could be found, nor could any traces be found to shew that there had been any. After gratifying the eyes of many antiquaries for a few days, the whole fell down, but not before a very excellent sketch had been made of it, which has since been lithographed. There is, therefore, possibly an original sketch somewhere, maybe with a plan? Again my sincere thanks to Dr Green for making this information accessible to the rest of us!